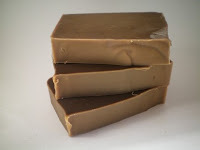 We've started using all natural soaps, and are loving them. My recent favorite though are shampoo bars...all natural, no plastic packaging to throw away, and they work great! If you've never tried them, give them a shot - your hair will be squeaky clean with no build up. I've used a few, and right now my favorite is this White Birch Bark shampoo bar by Pink Parchment Soaps. It lathers nicely, smells fresh and clean, and she ships quickly! Next on my list to try is a shampoo bar by Bar None. Apple Cider Vinegar is a great conditioner, Jen. You need to dilute it with water though:) I do mine 1 part ACV to every 5 parts water.